Polyphenylene Sulfide Market (PPS Market) was valued at $982 million, and is expected to reach $1,856 million by 2022, supported by a CAGR of 9.6%. Polyphenylene sulfide (PPS) is widely used in the manufacturing of automotive components and electrical & electronics industry due to its high performance thermoplastic property. The demand of PPS has increased because of its other exceptional properties, such as chemical resistance, corrosion resistance, and easy moldability. The report exclusively focuses on current market trends and future growth opportunities in the polyphenylene sulfide market. The report also focuses on various applications of PPS, which include automotive, electrical & electronics, aerospace, industrial, medical/healthcare, and others. Moreover, the report analyzes the current market trends of PPS based materials in different geographies and suggests the future growth opportunities by analyzing government regulations & policies, thereby further increasing the consumer acceptance of polyphenylene sulfide (PPS). The key players in the global polyphenylene sulfide (PPS) market has adopted different key business strategies, such as acquisition, expansion, product launch, joint venture, new application development, and investment to withstand in the competitive market. 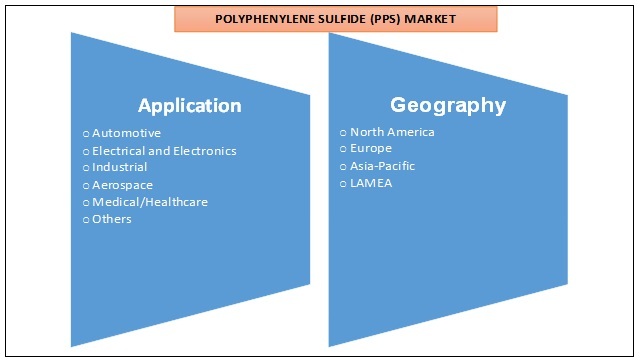 The polyphenylene sulfide industry players profiled in this report are PPS manufacturers and distributors who serve the product globally to several end-user industries. The data pertaining to polyphenylene sulfide industry players and their strategic moves are gathered through annual reports and press releases of the respective companies, various blogs, available on the website, and expert interviews across the industry. 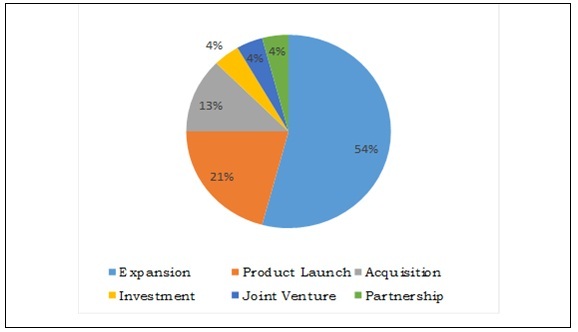 The above pie chart represents the percentage split of the strategies adopted by the top companies operating in the global polyphenylene sulfide (PPS) market. 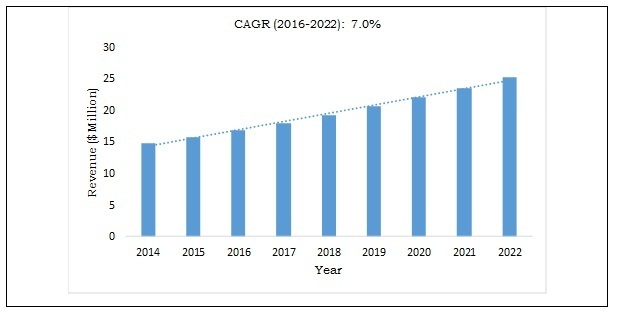 Expansion is the leading strategy adopted by the key players in this market followed by product launch, acquisition, partnership, joint venture, and investment to widen their geographic reach in the electronic chemicals and materials market. Expansion captured around 54% share of the total number of strategies adopted during 2011&dash;2016. 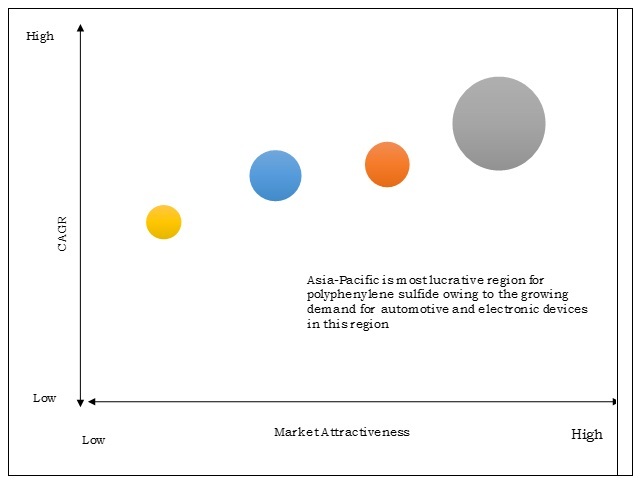 Asia-Pacific is the most attractive region in the global polyphenylene sulfide (PPS) market and it is expected to be the first preference for new entrants owing to the growth in demand from automotive and electronic devices sector in this region. China is projected to be the fastest growing country in the Asia-Pacific region during the forecast period both in terms of volume and revenue. The Asia-Pacific polyphenylene sulfide market share revenues are expected to grow at a CAGR of 10.4% during 2016&dash;2022. Europe is the second most attractive polyphenylene sulfide market for investment. The growth in electronics industry, technological advancements, and increase in government legislations to support eco-friendly materials are the key factors responsible for the growth of the polyphenylene sulfide (PPS) market size in this region. PPS is a high performance thermoplastic having exceptional properties such as easy moldability, flame retardant, chemical resistance, and it can also be employed over a wide range of temperatures. Increased advancement in automotive and electrical & electronics industry are driving the market for PPS worldwide. Germany is known as a birthplace for automobiles and is a leader in producing passenger cars in Europe. Polyphenylene sulfide (PPS) is generally used in automotive industry because of its remarkable mechanical properties, such as impact resistance, resistance to abrasion, scratch resistance, thermal stability, easy moldability, and excellent appearance. In 2015, U.S. was the largest market of passenger car in terms of value. PPS’s exceptional properties drives its demand in the manufacturing of passenger car’s components. All these factors are projected to drive the market for PPS during the forecast period. Increase in population and urbanization has driven the electronic market in the Middle East region. Increased advancement in automotive industry, such as increase in the demand of fuel efficient and compact system drives the market of automotive industry in South Africa. In 2014, Turkey has already been chosen as a regional hub for electronics by many market leaders including Microsoft, Intel, and General Electric among others due to its geographical and demographic advantages. Turkey strongly focuses on the research & development activities and Turkey has 35 R&D centers that are related to electronics sector. Patents are valuable assets for the companies and are submitted to protect the newly originated technologies. The highest number of patents related to polyphenylene sulfide (PPS) were registered in 2014. The increased advancement of automotive and electrical and electronics industry and PPS’s exceptional properties such as light weight, heat resistance, tensile strength, and electrical conductivity leads to rise in the demand of polyphenylene sulfide (PPS) from companies and helped further to use their PPS products in more applications and develop new profitable products. Thus, to stay ahead on the technology curve, companies innovate and get their innovations and technologies patented. The highest number of patents related to polyphenylene sulfide (PPS) were registered by Toray Industries during 2010&dash;2016. Company’s strategic expansion in overseas countries and high overseas sales ratio has encouraged the company to invest in R&D and file patents in foreign countries. Toray Industries hold 31% share of the total patents registered during 2010&dash;2016 followed by Shanghai Genius Advanced Material Co., Ltd. and Sichuan Deyang Special New Materials Co., Ltd. holding 5% and 4% share, respectively. This report provides an extensive analysis of the current polyphenylene sulfide market trends, future estimations, and dynamics from 2014 to 2022 of the global polyphenylene sulfide market, which assists to identify the prevailing opportunities. Geographically, the market is analyzed based on various regions such as North America, Europe, Asia-Pacific, andLAMEA. Exhaustive analysis predicts the applications that are currently used along with the variants that would gain prominence in the future. Competitive intelligence of leading manufacturers and distributors highlights the competitive scenario across the geographies. 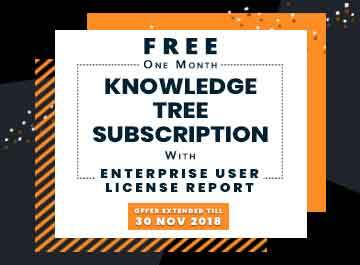 An in-depth analysis of current research and developments within the market is provided with key dynamic factors that interpret the market behavior. Extensive analysis is conducted by following key product positioning and monitoring the top competitors within the market framework. Key market players are profiled and their strategies are analyzed thoroughly, which portrays the competitive outlook. 6.9 Chengdu Letian Plastics Co., Ltd.